Call us at (952) 548-5328 and let our designers guide you through the order process from concept to delivery. Please call 952-548-5328 or stop by Lunds & Byerlys St. Louis Park and visit Lunds & Byerlys Gifts. One of our experienced designers will guide you through the assortment of basket options including contents, price and delivery. Do you offer pre-made baskets? We have a selection of grab-and-go baskets available. This selection is filled with standard and seasonally themed shelf-stable items. Do you offer corporate gift baskets? Yes! Many organizations call to order corporate reception, thank you, holiday or incentive baskets. Through the consultation process, we recommend the best contents, basket, box and bow that reflect the occasion and the organization’s brand. Fulfillment depends on the order size and contents. We always appreciate adequate lead time as some products may need to be ordered. Please call us at 952-548-5328 for a quote. 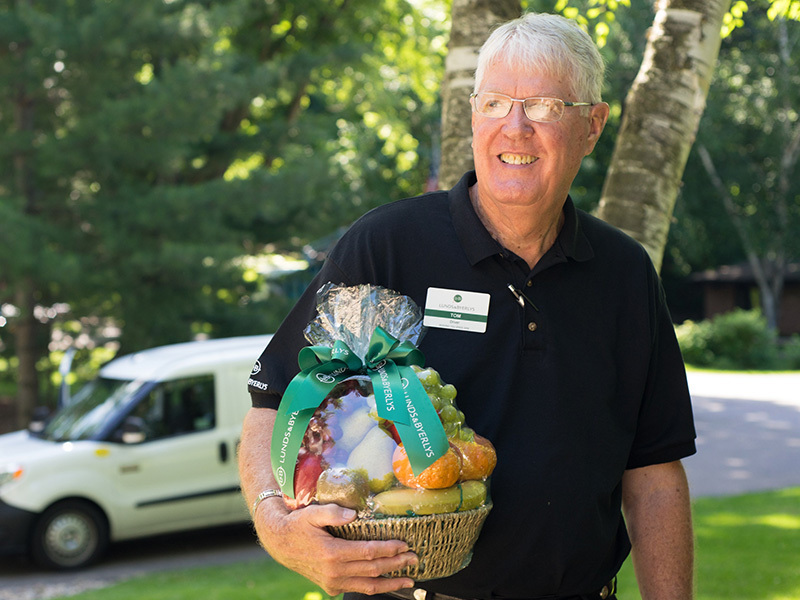 Local delivery – Yes, we deliver within the metro area. Delivery costs vary and are dependent on the distance from our St. Louis Park store to the recipient’s address. Please feel free to call us at 952-548-5328 for a quote. Delivery to greater Minnesota and the continental U.S. – We use UPS to deliver outside of the metro area and the continental U.S. Delivery costs vary and are subject to a shipping and handling fee. Note that we don’t ship perishable items as we can’t guarantee the quality of the products upon arrival. International – Unfortunately, we don’t deliver internationally as each country has different import laws. Can I pick-up my custom basket? Absolutely. We are open 10 a.m. – 6 p.m. seven days a week. If you need to pick up a basket after hours, please let us know and we can arrange a safe place for your basket until you’re ready to pick it up.